Very helpful front desk workers! They were available to answer any questions I had about my appointment. The dental assistantand the dentist were very warm, welcoming, and informative, answering any questions I had about my appointment. Great office! Excited to have a regular dentist again. Very helpful front desk workers! They were available to answer any questions I had about my appointment. The dental assistant and the dentist were very warm, welcoming, and informative,answering any questions I had about my appointment. Great office! Excited to have a regular dentist again. Dr. C. Judy Jeon was born and raised in South Korea until she was 11 years old when her family moved to America. She grew up Maryland and attended the University of Maryland at College Park where she received her Bachelor of Science degree. Then after a year working as a researcher at the National Institutes of Health, she attended the University of Maryland - Baltimore College of Dental Surgery where she received her Doctor of Dental Surgery degree in 2007. After dental school, she completed a general practice residency at York Hospital in York, Pennsylvania. 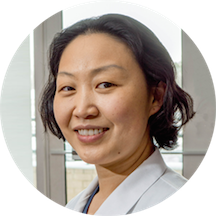 Dr. Jeon believes that the only way to gain patients' trust is to treat them as how she wants to be treated. She takes time to listen to patients' needs and treats them with care. She enjoys practicing all fields of general dentistry. She currently lives in Laurel with her husband and two young children. She enjoys spending time with her family and she aspires to travel to different parts of the country and the world in the future. Dr. Jeon offers services that include new patient exams, fillings, crowns, bridges, root canals, whitening, dentures, veneers, implants, dental emergencies and dental consultations. She's awesome, made me feel comfortable and answered all my questions. Very friendly staff, comfortable waiting area. Appointment went quick with very little wait time. This was my first visit. I left the office thinking that finally I found a dentist that took the time to discuss a treatment plan without being " pushy." Everyone was very warm and welcoming. !! I would definitely recommend this practice to friends and family. Mona H.
It was really a great expience and the service was great. I was actually seen by Dr. Park, who shares the office with Dr. Jeon. I was seen promptly and was in and out within an hour (new patient exam, cleaning). What followup services were recommended was explained to me clearly, and all the staff were friendly and professional. I am very happy with Dr. Jeon. She was nice and listened to my problem about my cracked tooth and infection that my other dentist ignored. She took xray and spoke clearly about the problem and recommended a Endodontic Specialist todo a Root Canal. You would be smart to choose her for your dentist. I actually had a male Dr who was very good and accommodating. I was seen immediately, everything was explained fully and it was a very good visit. Just moved to MD and feel like I found my dentist. She was amazing! Extremely funny, and made you feel comfortable! Would recommend to everyone! My 4 year old's first Dental visit was with Dr. Jeon. He was not sure about having his teeth cleaned and the water and air in his mouth but her bedside manner with young children is wonderful. It went so muchsmoother than I expected and he felt comfortable and not afraid. Very nice visit. Doctor Jeon was very friendly and worked well with my Daughter She explained everything very clearly.